Down for breakfast all in good spirits decent breakfast apart from mine host trying to be too nice. They were down on their bookings and are paranoid you have to have sympathy. While we were eating Karen rang Colin and must have asked where we were. Colin had to ask which town we were in which caused great hilarity. 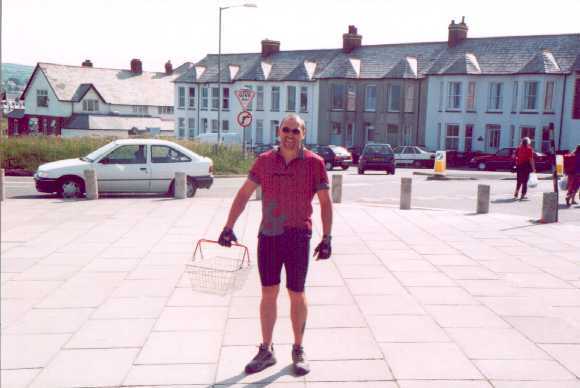 Anyway 9:30am we were loaded and away up to the Somerfield Supermarket for provisions, another perfect red hot morning. We checked with the Tourist information re the Tarka trail we were told what part was open. We followed the road out of Bude along the canal and then climbed, this holiday is all climbing. 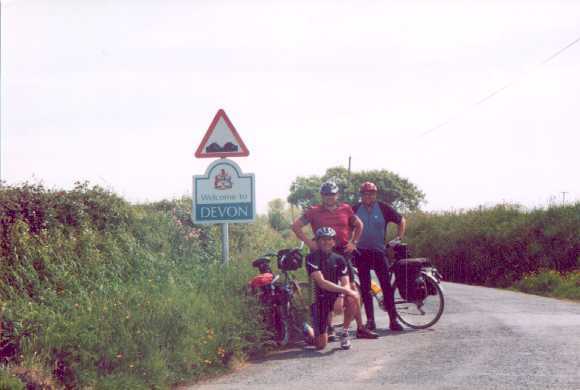 We hit the Devon border the countryside was a little more undulating. And the people in the villages became more friendly Strange? It was sad to se all the empty fields. Graeme started calling the hills 1 scone or 2 scone hills and also developing a system with his hand which gave you the gradient. 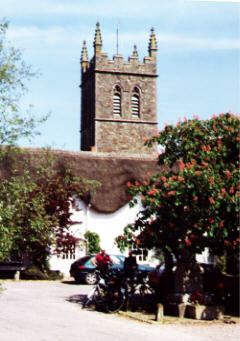 Colin's phone rang outside Holsworthy, as we were going down hill. Amazing he can freewheel downhill and talk on the phone at the same time, round about that time I got a puncture, yes me its always me? Anyway repaired and on route after 10 minutes. There should have been a nice flat off road section over the viaduct to the town but guess what it was closed due to Foot and Mouth but we had to cycle down a hill off the road to find it was closed off with Police tape, why the hell cant they give you advanced warning at the road end. So it was uphill into Holsworthy which was a nice market town and it was market day. we stopped and had an hour with a pint and hot dog sitting in the beer garden in the sunshine. Fully refreshed we set off, Holsworthy had been a stamping station and she was the first girl switched on to stamping. Round about this time my backside was SORE with a with a capital "S". It was painful I banged in ibuprofen pain killers, and some cooling after shave balm. Graeme said "I might be a trained medic but I'm not looking at that". We picked our way through the pretty lane'd countryside, to Black Torrington where the prospective Conservative candidate nearly knocked Colin off his bike as we cycled past and he was just climbing out of his range rover with his entourage, and with the Tarka trail closed we hit a quite few more hills. We cycled down to the river and then we had to climb and climb and climb, Great Torrington bank which seemed to go on for ever. We eventually hit the town and even Graeme admitted he was struggling. We had a shop stop and refreshed, people in that town looked at us as though we were Martians, its obviously so high up they never see cyclists. Although it feels like it this holiday, you cant climb hills forever and eventually, we had a downhill run out of Torrington and hit the valley bottom there was nothing for it and we had to follow the main road towards Bideford, we cycled gently along looking for a way into the Trail without much luck, as we neared Bideford a racing cyclist passed us and Colin gave chase. This lad was out for a training run and the Bishop Bullet with panniers clattering, rocking his mountain bike from side side was catching him, the racing cyclist was looking over his shoulder was obviously worried and if it wasn't for the fact that Colin hasn't a clue where we are going and so had to stop at the first junction he would probably have passed him. All this at the end of a long hard days ride. Into Bidefords over the river it was a pretty town and pleasant alongside the estuary. We picked up the tarka trail and thought great all the way to Bamstaple wrong? We got to Instow and the route was closed again so yes we had to back track and took the main road into Bamstaple, why cant they put the signs at the end of roads? Eventually hit Bamstaple and followed the river along and out and dropped straight on the digs, good guy was friendly and we were well set up..
in the North Country Inn where else. Good pub and good food. Altogether after a hard ride we had a good night, and didn't take a lot of rocking.